mental ray for Maya 2016 SP2 is now available for download here or it is automatically installed by the Autodesk Application Manager. It ships with mental ray 3.13.1.9 which contains improvements for the BSP2 acceleration structure in certain cases, bug fixes for multi-host rendering and for some framebuffer handling issues. The release notes provide more details. Several bugs were fixed in the mental ray for Maya translator, notably concerning undo when modifying simple mila_material parameters, satellite rendering issues, and a workflow improvement with regard to the new Create->Lights menu and Environment lights. mental ray for Maya 2016 SP1 is now available for download here. It ships with mental ray 3.13.1.8. Both the mental ray core and the integration provide important fixes that we will list in this post. MDL rendering: latest MDL fixes are incorporated into SP1. Also, when you created two file texture nodes both referencing the same uv-tile sequence, this could lead to a crash with the previous version. This is now resolved. Since Maya2016, the new shadow mode default is “shadow segments”. This mode supports all ray tracing effects including subsurface and volume scattering in contrast to the approximate, thus potentially faster “simple” shadows. With the latest mental ray, we have improved the performance of “shadow segments” on scenes with extremely high depth complexity. Light Importance Sampling is now faster for scenes with a mixture of large and small are lights. Mental ray render times with procedural shaders/textures (ocean, fractal, and so forth) are also improved. Today we are happy to announce that our NVIDIA mental ray® Standalone software is now directly available from us at NVIDIA. mental ray Standalone is a command line software necessary for large distributed rendering processes typically on render farms. 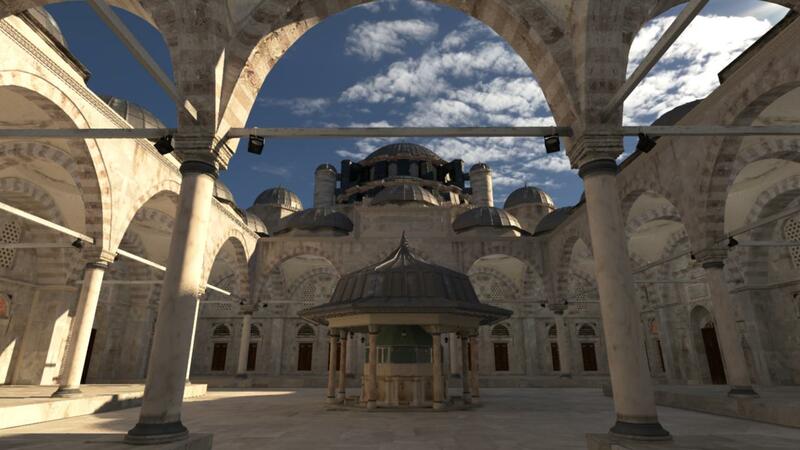 With a purchase from NVIDIA you receive the current and previous versions of mental ray. This includes immediate access to a private forum with direct support from our development teams. Upgrades of the initial license purchase includes one year of maintenance as well. Autodesk 3ds Max 2015 and Autodesk Maya 2015 ship with mental ray 3.12 which includes a prototype of our new global illumination engine accelerated by the GPU. 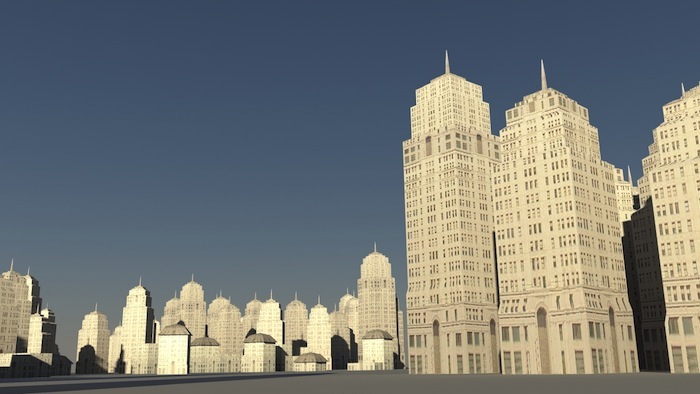 We encourage our 3ds Max and Maya users to try it out. Your feedback will help us in making this a big step forward into the future of rendering with mental ray. While the current version is in prototype status and not yet feature complete, we are constantly improving the algorithms and adding new features. Your input is most welcome in this process. The key idea of the new GI engine is full and exact simulation of the lighting interactions in a scene. This way, we overcome drawbacks from caching techniques and interpolation, and make mental ray more interactive and predictable. The brute-force raytracing approach is accelerated on CUDA capable NVIDIA GPUs making it particularly attractive in this set-up. Its result gets combined seamlessly and automatically with the primary rendering done on the CPU. This ensures full compatibility with existing custom shaders, which do not need to be touched in order to take benefit of the new GI engine. In the current version, the GI GPU mode considers diffuse-diffuse bounces only, similar to what final gathering typically computes. In fact, if this mode is enabled without setting further parameters then finalgather settings are used to derive reasonable default parameters to render towards the same quality. 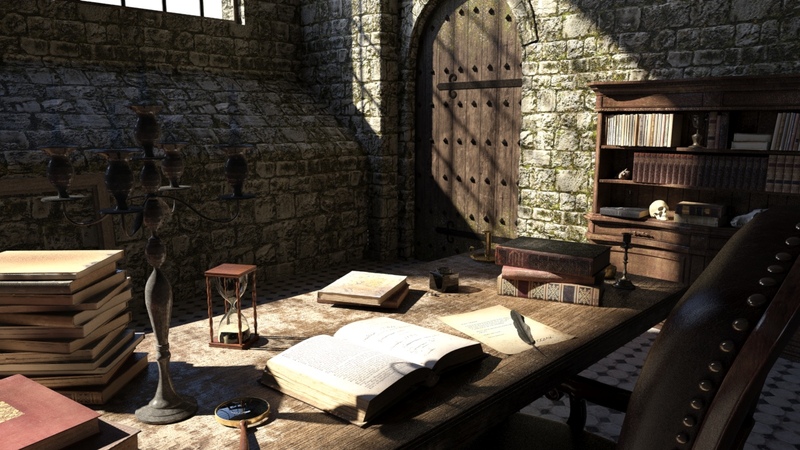 If certain prominent ray tracing effects like mirror reflections or transparent windows are not used in a scene then the fastest diffuse mode is best suited. For current limitations, see below. 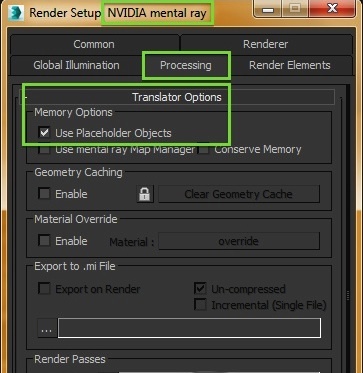 The GI GPU mode can be enabled and controlled with scene options or on the command line of the standalone mental ray. 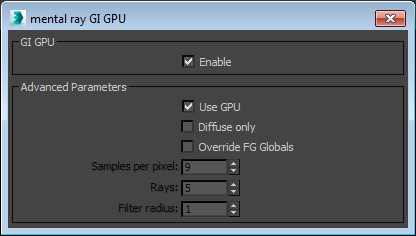 We also provide scripts for Maya and 3dsMax that provide a simple GUI for enabling GI GPU (see screenshot). Please, note, that this is by no means how we envision it to be integrated in the applications. It’s rather to provide easy access to users that would like to test the prototype. GI GPU transfers the scene geometry, presampled shader data, and some constant amount of buffer memory onto the GPU. Textures are not needed on the GPU. In the case that the GPU memory is not sufficient, there is an equivalent CPU mode. The new GI engine can still be used but the GPU acceleration must be disabled (uncheck the ‘Use GPU’ checkbox). There is also an absolute limit of 25 million triangles. For GI GPU to be effective, finalgather must be turned on. Some features are not yet supported: distorting lens shaders, motion blur, particles, volume shaders, camera clipping planes, progressive rendering. There is only limited support for scattering shaders, emissive materials, and hair rendering. Before testing GI GPU, we recommend to install a recent version of the NVIDIA graphic card driver. mentalray for Maya 2015 SP2 is now available and provides important fixes around XGen hair rendering, layering shaders, massive assembly scenes, native IBL and more. Here’s a short list of fixes that come with the new mental ray 3.12.1.16 and the new version of the mental ray plugin. Please, consult the mental ray and the Maya 2015 SP1 and SP2 release notes for the complete list. The performance of the XGen hair shader has been significantly improved for scenes with dense hair. Several fixes in the shaders and the UI – namely, possible crash with subsurface scattering initialization, possible NaN values and a too bright contribution of the user IBL environment shader in glossy components, reordering layers with bump or weight connection. Some mental ray shader nodes saved in .mb files were not compatible between 2014 and 2015. This is now fixed. Improved performance of the GPU and multi-CPU rendering, and added support for NVIDIA Maxwell GPUs. Fixed possible crash when rendering large scenes with multiple assemblies exceeding physical memory. IPR now automatically updates when changing the new “emit light” features which control the native environment lighting. Fixed brightness difference in IPR versus Render Current Frame. Recently, we were asked about a not-so-well-known feature to help rendering heavy scenes with mental ray inside Maya, or 3ds Max. You may skip the introduction and jump down to the setting at the end of this article. For those who are into details, here is a little background. As you might know, mental ray is based on the concept of “loading on demand”, which helps to cope with huge amounts of data that won’t ever fit into the available memory at once. Buying more memory for your rendering machine will help, but, at the same time, your scene size and texture needs have grown again. Well, typically you should not notice since mental ray takes care of handling these cases automatically. It delays all operations that are memory exhausting or expensive to compute to the latest point in time, and only executes them when really needed to render the current pixel. That is true for scene data, when loading elements from an assembly or Alembic archive, but also for textures, reading and decoding only those textures needed, possibly even keeping just pieces of it in memory, so-called “tiles“. Most importantly, the tessellation of source geometry into triangle data is done on demand only, absolutely critical when working with very detailed displacement. Finally, this mental ray machinery of demand loading is also exposed to shader writers. 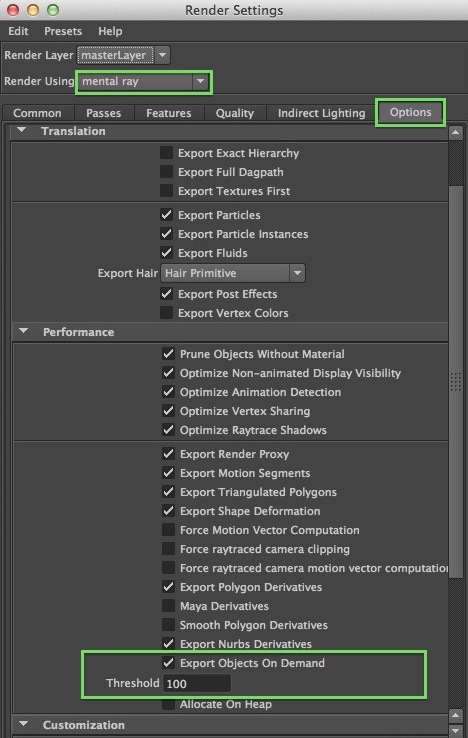 Enable “Render Settings > Options > Translation > Performance > Export Objects On Demand“, as marked below. What is it doing ? It does not pre-translate geometry before rendering starts, as it usually does, but delays it to rendering time. The translation just creates so-called “placeholders” – basically bounding boxes around the pieces of geometry – that will trigger execution of the actual translation only when a ray hits that box (or a certain feature is requesting the actual geometry). Because translation becomes very fast it finishes almost unnoticed, so that the Maya progress bar typically starts with “mental ray rendering…” . Leaving the “threshold” setting at 0 (zero) will cause all objects to be demand-loaded, even if tiny. That may be inefficient. 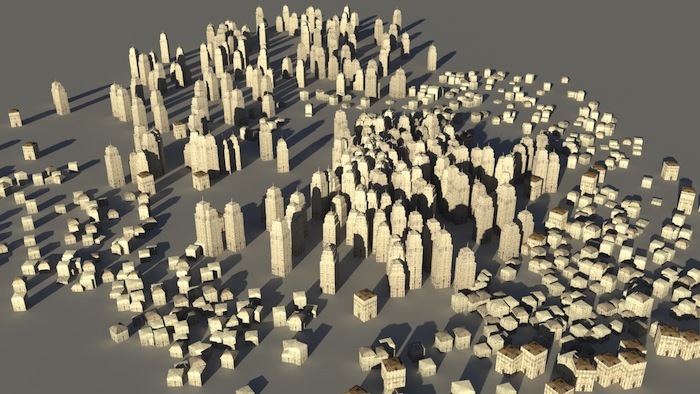 Increasing this to a higher number, only those objects with its number of points/vertices beyond the value will be considered for demand loading, the rest gets pre-translated. Please remember, that in a ray tracing or global illumination context all the objects may be demand-translated immediately anyway even if out of sight! In that case there may be no real benefit using this mode. And, this translation mode has a certain runtime overhead attached to it, so it may pay off only in certain cases, and only with an appropriately chosen threshold. This setting is saved with your scene. That means, it will also work with “Maya Batch”. You are working with 3ds Max ? The same feature is available here too, enabled with “Render Setup > Processing > Translator Options > Memory Options > Use Placeholder Objects“, as shown below. Just give it a try, and leave a comment if you find it useful.